Learning how to make money outside of a traditional job is great as there is literally no limit as to how much you can earn. Seriously, building a side hustle has been such a lifesaver for me. It’s what helped me build my emergency fund and eventually helping me taking the leap into entrepreneurship. Whether you’re looking to pocket a few extra dollars to save up for a family vacation, pay some much-needed bills or save for a rainy day, learning how to make extra money isn’t hard. There’s such a low barrier entry for many of the ideas discussed, find even ten of these ways to make money that works for you and it’s virtually impossible to not make money fast. 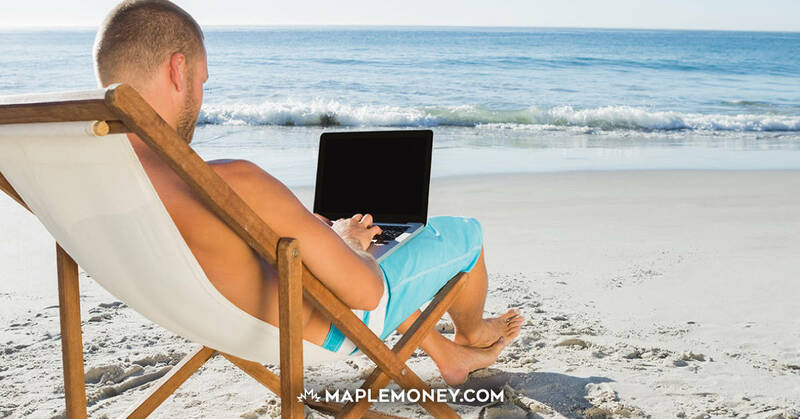 You can also listen to Philip Taylor on the MapleMoney Show, where he discusses the benefits of having a side hustle or two to earn extra money. Click play to hear PT share a few income ideas that you can start right away. Want to earn money with minimal effort? Then you need to try this rewards program that literally pays you to shop online. Drop is a program that will help you earn points towards gift cards. All you need to do is to sign up for an account, and link any credit or debit cards you use for online purchases. Download the app and every time shop through it using one of the linked cards, you’ll earn points. Click here to find out more. Do you have a knack or knitting or create leather products? Think about selling some of your creations on Etsy, the hub for all things creative. Many people have found success selling all kinds of goods from jewelry to handmade soaps. It’s free to create an account and you can manage all your purchases from their dashboard, from who purchased your products to whether your products have been delivered. To get started, you may need an upfront investment in order to get your supplies. If your items are good and you can provide excellent customer service, you can easily recoup your costs. Many people have turned Etsy into their full-time ventures, so there’s definitely money to be had. 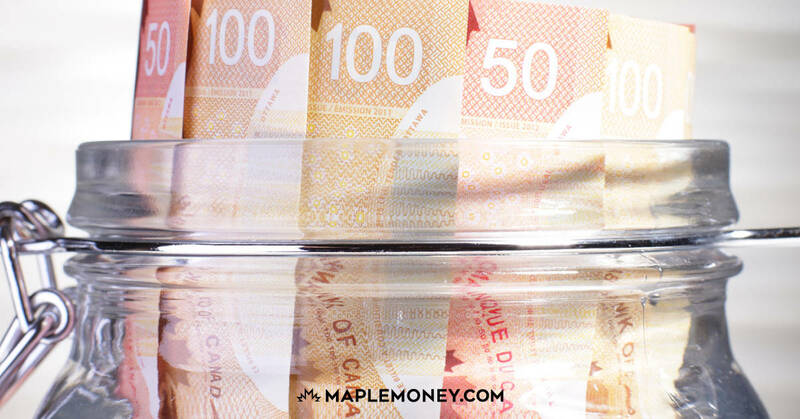 You can lend money to Canadian businesses with Lending Loop, the country’s first peer-to-peer platform for small businesses that’s fully regulated. You can help a fellow Canadian small business out by giving them access to affordable funding. Instead of jumping through hoops and even risk being denied by banks, you now have the power to help someone grow their business. Of course, you as an investor can earn a bit of money in the process. Once you sign up for free, you just need to invest a minimum of $200 fund your account. You then can purchase notes at a minimum of $25, spread out over to as many as you want. You’ll then receive payments monthly in your account, either to reinvest or withdraw. Fancy yourself a designer but aren’t into making your own crafts? Then designing products may be for you! You don’t need to worry about doing test prints of ordering a bunch of shirts and worrying about if you’ll sell them. There are places where you simply upload your designs and you’ll get paid every time someone purchases one of your creations. Places like Zazzle and CafePress lets you upload your artwork onto the products of your choice (like cellphone cases and t-shirts). They take care of the customer service end, including shipping the item when someone orders it. You then get a percentage of the sale. If you have a lot of items in your home and are looking to get rid of it, why not earn some extra cash for it? Who knows, some of what you own could be really valuable. Even if it’s knick knacks, selling a few here and there can really add up. Yes, there are the usual places like eBay, but it can take a lot of time to create listings and ship the items. You’re also paying a service fee, meaning you don’t get to keep all of what you earn. You can try Let Go, which is a neat app that allows you to snap a photo of what you want to sell and name a price. You can add a quick description and it’ll show up on people’s feed if you’re in their immediate area. If someone replies to your ad, all you need to do is agree on the price and a pickup location (make sure it’s in a public area) and you’ll be rewarded for your efforts. Why not use your car to help you make money? Sign up with Uber and get paid to drive people around during your spare time. Some even squeeze it in during their afternoon commute, picking up whom they choose if it happens to be on their way home from work. As for how much you’ll get, it really depends on how many kilometres you’ve driven, demand and which vehicle option you are operating in. But it’s a great way to make money because it fits around your schedule. All you’re doing is delivering food on your schedule, being paid for bringing food from participating local restaurants. Since Uber has been expanding into many new cities in Canada recently, there probably aren’t that many delivery-partners yet on the road, so it could be a great way to make some extra money fast. Nielsen Homescan is a program that will pay you to tell them what you do when you go grocery shopping. Once you sign up for their program and get approved, you’ll get a scanner. Anytime you grocery shopping, you just scan your purchases. You’ll then earn points which can be redeemed for merchandise. There’s also a quarterly draw for a $2,500 prepaid Visa card, which is not too shabby. Head over to their application form to see if there’s an opening available. If you have extra space in your home, why not rent out your spare room? All you need to do is sign up for an account at Airbnb to get started. You don’t necessarily need to have a long term tenant, just host tourists when they come into your area for a vacation. To prepare your room, you’ll need to make sure it’s presentable (maybe update your decor), and provide amenities such as towels and toiletries. Some hosts go so far as to point out local tourist attractions. If you live in a touristy area, you may even be able to bump up the price per night during peak travel seasons. Fancy yourself a master tarot reader? Or create social media graphics with ease? You may want to check out fiverr, a treasure trove of gigs people pay $5 for. All you need to do is to post a job, set your price and watch the requests come in. And to earn even more money, you can set your prices higher. For example, a Fiverr sellers can create different pricing tiers for the same service, where you can charge more for premium work. If you’re interested, have a poke around the site and see what people are offering up for sale. See where your talents can shine and set up your first service or product to sell! While starting a blog isn’t going to earn you money as quickly as some of the other options on this list, it has the potential to earn you a lot. If you keep testing and taking risks, you could be earning some nice passive income. Again, this could take months to do, so you’ll need to be patient as you’re learning the ropes. There are many ways you can earn money with a blog. Some use it to showcase their writing chops to land freelance writing clients (see number 20 on the list) while others make money off affiliate commissions. What happens is that you make recommendations for products and services on a blog post (like some of the options in this post), and get paid for doing so. Starting a blog is really simple. All you need to do is get a domain name and a website host so you can start creating your site. Namecheap is one of the best places to get a domain name for a low price, and the hosting company Siteground offers some of the best customer service, especially when you get into any technical snafus. The best part is that their plans start at $4 a month. You read that right. You can earn money while losing weight. Think of it as a win-win, where you get healthy and rich! Wondering how it works? Places like and Healthy Wage and DietBet will award you prize money to reaching your weight loss goals. You start off by creating a weight loss goal then signing up for an account. Once you do so, you’ll be able to join in games or groups and make a wager on the prize you want. You’ll need to have weekly weigh-ins and your team or contestants and when you reach your goal, you win a prize! If you want to enlist your co-workers, Healthy Wage gives you the option to create a corporate challenge. Don’t bother watching commercials and make some spare cash instead. There are many places that will literally pay you to fill out short surveys. Many of these companies are looking for customer feedback or conducting marketing research, and are all too happy to pay for your opinion. To get started, all you have to do is sign up for free accounts and submit information, such as your age, gender and location. You’ll then be offered surveys to fill out. Most of these will take only a few minutes and you’ll earn points for each one completed. Once you have enough points, you can then redeem them for gift cards or cash via Paypal. Two you can check out right now are Survey Junkie and Maru Voice. Both are super easy to use. You need somewhere to deposit all the money you make, right? Well, the cool thing is banks now pay you to open an account with them. If you do a search, you may be able to earn a few hundred dollars just by doing so. If you’ve never opened a Tangerine bank account before, you’re in luck. Their Tangerine savings account is currently offering $50 in cash bonuses. All you need to do is open an account with at least $100 and set up an automatic savings program. You’ll also earn 2.50% APY for the first six months, which is a pretty nice rate. For those who want a chequing account, Tangerine is also offering sign up bonuses for that too. Once you switch your payroll direct deposit or switch at least two pre-authorized payments, you’ll earn a $100 bonus. Investing is one of the best ways to earn passive income. You literally put money into an investment account and watch it grow. In theory. The reality is you’re paying a lot of fees, which eats into your savings. With a typical investment account, you’re paying fees to your financial advisor, the financial institution the advisor works for, as well as their head office. All this to say, if you can find a company that can cut out the middleman, you’re going to save more money. That extra that could have gone into fees can now be funnelled back into your investment account. A robo-advisor will help you optimize your portfolio to maximize your earnings. If you sign up with Just Wealth right now, you can nab yourself a $50 dollar bonus. Yes, people will pay you to be their bridesmaid! Believe it or not, there are plenty of brides who may have had a falling out with one of their bridesmaids or who’ve simply abandoned their duties. Think of a bridesmaid for hire as a quasi-planner as well, someone who helps the bride makes sure the day goes smoothly. If you want to be a professional bridesmaid, you’ll need to be prepared to fake an identity. Some brides want to ensure absolute anonymity, so making up a story about who you are and your relationship with the bride is important. And if you can pull it off, you could be looking at close to a thousand dollars on average for your efforts. If you’re available during peak wedding season, just imagine how much you can earn. There are always parents who want to get extra help for their children, especially those who are second language English learners or who want a head start during the summer holidays. You can always start by posting flyers around the neighbourhood to gauge interest or working part-time for a tutoring company to get some experience. If you’re a teacher, then use that knowledge to your advantage. If none of the above interests you, you can try tutoring virtually. You may even think you need to have a specialized skill to be able to tutor someone on a subject. Well, that’s not true at all. At SayABC, you can teach ESL kids English right from the comfort of your own home. There are some requirements you need to fulfill as well as go through an interview process. However, once approved, you could be earning around $19 an hour. Even if you’re an amateur photographer, you can still make money off your skills. There are many stock photo sites that will happily help you sell your photos. All you need to do is create an account and upload as many photos as you like. Some sites will have approval process as to what types of photos they want. To help them sell well, make sure to tag them correctly and only submit your best stuff. If you love pets, this could be the perfect side gig for you. There are plenty of folks who live in small apartments who need to take their dogs out but simply don’t have the time. Or those who work long hours and need someone to give their pets love and attention. Become a dog walker and you’ll get to play with some cute dogs and get some exercise at the same time. All it takes is you putting up flyers (or even an ad on Kijiji) advertising your services. As your reputation builds, you can even offer dog sitting services for those who are headed on vacation or a weekend getaway. For this, you’ll need to make sure you have plenty of space and treats for Fido. If you fancy yourself a writer, why not get paid for it? 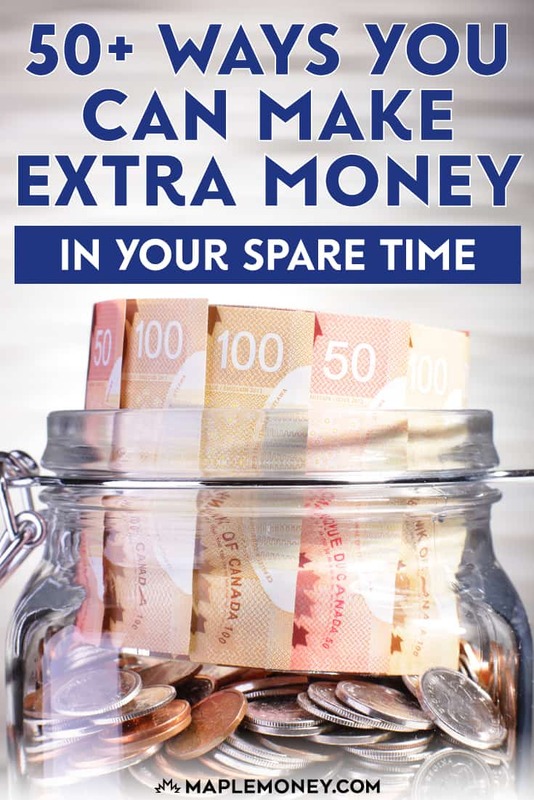 The barrier to entry is surprisingly low and with some effort, you can make some serious cash in your spare time. All clients care about is whether you can write well, that’s it. There’s no need for fancy English degrees, though having a specialized degree can be helpful depending on the types of jobs you’re after. For example, if you work in the IT field, you may be a perfect fit as a technical writer. To start out as a freelance writer, you’ll need to have a portfolio of work to show to editors. If you have written work, that’s great. Otherwise, there are plenty of blogs that will let you post blogs (much like this one) and give you credit for it. There are some free online portfolio sites like Contently that will let you create a profile and post links to articles you’ve written. There’s also freelancing websites like Upwork that have thousands of people who will hire people to write or edit for them for all kinds of industries. If you can get your foot in the door and earn a great reputation on the platform, you can easily have work coming to you. Many small businesses are always looking for help for their businesses. If you’re computer savvy, becoming a virtual assistant or VA is a no-brainer. People want help with tasks like data entry, scheduling social media posts, answering emails and even creating graphics. The more specialized skills you have, the more you can charge. For example, someone looking to hire out for a simple data entry task won’t pay as much as someone who wants a programmer to redesign parts of their blog. The $10K VA course can teach you how to make money as a virtual assistant. Then to get started, you can sign up for freelancer websites such as FreeeUP and Upwork. You’ll need to create a profile, including a portfolio of past work and your skills. You can then bid on jobs by submitting proposals. If you do a good job, your client will rate you. The more favourable ratings you get, the higher the chances you’ll get picked for jobs. Sure, you can babysit the neighbour’s kids, but you can maximize your working hours by watching a few kids at a time. If you live in a neighbourhood with plenty of kids, you can easily offer to help parents out whenever they crave a night out or want to go on date nights. You may need to make sure your home has plenty of space (and entertainment), but if you’re good with kids, this could be a great option. You’ll need to keep in mind that if you’re watching groups of kids or are advertising yourself as a daycare, you may need to get a certification. If that’s too much, then babysitting is always a good option. Those parents will be so grateful. Many homes would love the extra help, especially those with extremely busy schedules. Many families would love for someone to do everything from light housework, to doing the laundry and even small repairs. While you may need to provide your own cleaning supplies, many homes will be happy to let you use their vacuum cleaner. You can either charge by the hour or by home. If you’re not into cleaning, you can get paid to help people organize their homes. Many just want someone to help them declutter and even provide systems on how to keep their homes organized. You can get paid to give suggestions on storage options, decluttering and even helping someone go through the purging process. Most organizers charge anywhere from $25 to $50 an hour. Swagbucks is a great site where you can earn points whenever you watch videos via their site or play the games they have featured. The points you earn will vary and you may be able to get bonuses during different days of the week. The games they have available are pretty fun, such as Angry Birds, Tetris and Wheel of Fortune. Once you earn enough points, you can then redeem them for gift cards. Swagbucks is currently offering $5 for anyone who signs up. Yes, you can earn money right from your own home by transcribing for businesses or the court. If you have fast typing skills, it can be easy to get started. However, that’s not the only skill you need to have. You’ll need the ability to listen to audio files, understand legal jargon (if you want to be a legal transcriptionist) and have knowledge in certain programs. If you’re interested but unsure of the types of skills and how to get your first gig, Transcribe Anywhere is a totally affordable course that’ll help you understand the in and outs of the business. You’ll learn what equipment you’ll need and how to market yourself. You even get tons of practice drills so you can hone in on your schools. It is a bit of an investment, but considering the average salary of a legal transcriptionist is $60,000, you should be able to make it back. If you’re going on long vacations or don’t drive your car that often, you should consider renting it out. Turo is a service that lists your car on their website and renters can choose which dates they want to rent. You then arrange a pickup, hand over the keys and earn some cash. To get started, create a profile on the site, take some attractive photos and list your availability. If you have a RV, you can also rent that out as well. Outdoorsy is a service that helps you list your RV for rent. You make sure to create an attractive listing, including some nice photos to entire renters and then set a price per night. Your RV is covered for up to $1 million liability insurance policy and renters need to verify that they have a good driving record. If you have a lot of resources you created as a teacher, you can sell those for a pretty penny. Teachers Pay Teachers is a great online marketplace where teachers are specifically looking for premade lesson plans, printables and worksheets. If you’re artistically inclined, teachers also love to purchase posters they can stick up in their classrooms. Creating an account is easy and you can get started right way. Just make sure to list which provincial curriculum is for and instructions on how to use them. If you have sewing machine and know how to you it, you can help other mend or tailor their clothes. A lot of people need their pants hemmed, which you can easily do for a few dollars. Charge a little less than what tailors do and you’ll be able to drum up business quickly. If you can do more complicated sewing tasks, you can even target brides and bridesmaids to help them tailor their dresses. Knowing your way around graphic design programs can mean a pretty lucrative side hustle you can do in your spare time. Many website owners are looking for designers to help create printables, ebooks and simple social media graphics for their website. Many have even niched down, creating images for Pinterest or only design ebook covers. Figure out what you’re really good at and start targeting those who need it. Speaking of Amazon, it’s not just for selling books. If you have an idea for a unique product that has demand, you can sell on Amazon and save yourself the hassle of shipping by using “Fulfillment By Amazon”. My Wife Quit Her Job has a complete guide on how to go all the way from finding a product to marketing it. There are many companies that are looking for cars to advertise on. If you don’t mind mind having something on your car, you can easily earn up to $800 a month just by driving around. Essentially, businesses are renting the space on your car to use like a billboard. You can sign up at places like MarketYourCar.com and submit information such as location, make and model of vehicle. You’ll then be contacted if a suitable campaign comes up. A brand ambassador is someone who does a variety of tasks for a company, such as handing out flyers, free samples, or even wearing a shirt with the brand logo at events. Some events even hire ambassadors to mingle among the crowd to ensure the events go well. To find these gigs, you can dig through classified ads or even places like Craigslist. Be sure to vet them to make sure they’re legit. Those who are bakers or have excess vegetables may want to consider selling their wares at the local farmer’s market. Many people love to shop local, and if you have lots of fresh veggies to sell, people will come out and support you. If you sell baked goods and they’re really delicious, customers could come back for more every week. Lots of businesses are looking for voiceover artists for anything from radio and TV ads all the way to audiobooks. If you think you’ve got what it takes, you can start creating demo tapes of your skills. The more versatile the better. To increase the chances of getting hired, you’ll want to get listed in directories, such as Audible or even highlight specific skills, such as being bilingual. You can easily start a side business if you have lots of tools and equipment to make simple repairs for cars and around the home. Many people are always looking for people to install fixtures, replace shutters and even patch holes on walls. Some would love for you to help them make light repairs such as replacing spark plugs, batteries and even simple oil changes. Many gyms and yoga studios are always looking for great teachers. Some look for substitutes in case a regular teacher is sick or can’t make it to class. Most classes are on evenings and weekends, so you can easily squeeze in a few lessons throughout the week. The pay is anywhere from $25 to $40 a class, depending on your experience. If you have a large vehicle and a bit of muscle, you can help others move to their new home or apartment. People who don’t have enough things may not feel they can justify hiring a large home moving company. You can help pack up items, transport them and even move it to storage units if the client so chooses. You don’t need to be a CPA to be a bookkeeper. As long as you know your way around some bookkeeping software, decent computer skills and a willingness to help business owners, you could easily earn up to $80 an hour. To get started, you’ll need some bookkeeping software and learn how to use it well. Then target local businesses and reach out remotely as you drum up more work. Yes, companies hire real humans to test out search engines. As much as we’d like to think complicated algorithms are accurate, they aren’t always the case. Many of them are full of errors. You basically get paid to look at search engine results and judge them based on relevancy and usefulness. You can find jobs through Lionbridge and start once you take a qualifying test and conduct a quick phone interview. A focus group is someone who is specifically chosen based on their demographic or interest to gather and answer questions for market research companies. They’re similar to online surveys, except you’ll need to meet in person over a period of time. However, these get paid a lot more, so it may be worth looking into. Focus groups have a wide range of purposes, from trying out medicine, to being asked your opinion about an upcoming movie. Pay does depend on the type of focus group and how long you need to be there for. If you’re a great cook, there are many people who would love someone to help them prep their meals or even cook for them for events. You can start advertising around your neighborhood and provide some free samples and proof of your culinary skills. Some people may even ask you to prepare make ahead meals for the week. Treasure hunting at flea markets and thrift stores can result in some serious profits, if you know what to look for. Many people have found collectibles and sell them off ebay for at least twice the price. Even clothing, electronics and other items (like tools) are worth selling. The key is to figure out what something is worth and you can sell for, then be on the lookout for these items that are marked really cheap at flea markets and thrift shops. People make hundreds to thousands of dollars doing this, so it’s an option worth exploring. Many tourists rather have a local show them around than joining a big tour company, as it feels more intimate. You can act as a local tour guide, taking visitors on your favorite local places and more popular tourist attractions. Some may want to create personalized tours, while others would like if you create the itinerary. To get started, sign up for an account at Tours by Locals. Create a profile, set up a tour and a price and watch the requests come in. Washing cars doesn’t sound that fun, but starting a car detailing business can easily nab you a few hundred dollars a month, all for a few hours of work. To get started, all you need is to invest in some cleaning supplies, a car vacuum. You may want to either rent or purchase a pressure washer to ensure you can go from driveway to driveway to get customers. Believe it or not, there are still many people that aren’t so great with technology. You can easily help people get rid of nasty viruses, install computer programs or even install extra RAM. You can charge by the job or hourly, depending on what task it is you’re doing. Yes, you can use less energy to save money on your bills and get paid. If you’re a Toronto Hydro customer, sign up for OhmConnect and you can earn up to $75 right off the bat. You’ll then get notifications when you’re using energy from sustainable resources. If you turn them off and save energy for at least 30 minutes each time, you can earn anywhere from $100 to $300 a year. Ready to Earn Extra Money? Yes, 48 is a LOT of choices. You can simply pick any one and you can generate some serious side hustle money. However, not all these ways to make money mentioned are suitable for everyone. Before getting started, take some time to consider your schedule, budget and skill set to see which side business idea will give you the most chance of success. If you have a few you want to try, just pick and get started. There’s no better time like the present. What are you waiting for?